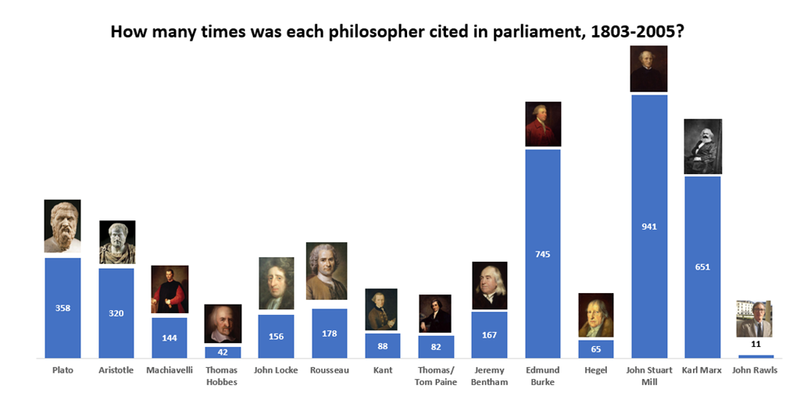 Which political philosophers have been cited most in parliament? So some people are swooning at the fact that France’s President can casually discuss Hegel, and contrasting Emmanuel Macron’s erudition favourably with British politicians. I think that’s probably a bit unfair. Surely you don’t get through three years of PPE at Oxford without being able to name-check the odd philosopher. So I decided to look up references to the major political philosophers in the British Parliament. Which thinkers struck a chord and stuck with our leaders? Given his intellectual influence in the UK, it’s probably unsurprising that Mill is dominant, and Marx’s significance is predictable, too. But I was surprised by the prominence of Edmund Burke, even accounting for his personal political relevance as a former MP. I was also surprised that those three were so far ahead of the rest of the field. So British MPs may be less comfortable with Hegel’s idealism, but they do like discussing Millian liberalism. ← Is it immoral to send your children to private school?